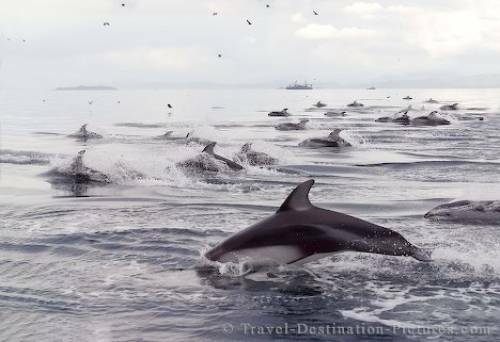 A group of Pacific White Sided Dolphins speed through the water off the coast of Vancouver Island in British Columbia, Canada. This huge group of Pacific White Sided Dolphins were really stirring up the water as they travelled through Blackfish Sound. They seemed to be on a mission to get somewhere. Pacific White Sided Dolphins are extremely agile marine mammals who inhabit the northern Pacific Ocean off the coast of British Columbia, Canada. They can often be seen riding the bow wake of boats as well as performing stunning acrobatic displays. Picture of a large group of Pacific White Sided Dolphins in Blackfish Sound, British Columbia, Canada.